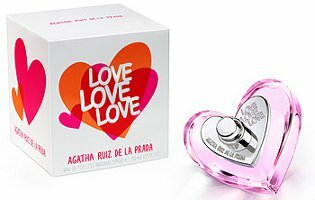 Spanish designer Agatha Ruiz de la Prada has launched Love Love Love, a new fragrance geared towards 'fun and romantic women'. Love Love Love hopes to be 'the perfect love potion'. The notes include mandarin, bergamot, cassis, margarita accord, rose, jasmine, berries, sandalwood and musk. Agatha Ruiz de la Prada Love Love Love is available in 50 ml Eau de Toilette. For a second I read this as just plain Prada and I was really confused. Puig puts them in the “masstige” (prestige + mass market) category, along with brands like Mango & Antonio Banderas, so that makes sense! I really do like the packaging & advertising. Sheesh. If I never see one of Mango’s tacky little dresses again, it’ll be too soon. And they do fragrances too? Yikes! The packaging and over-all design is very representatve of the designer, she has a very colorful graphics-oriented image. I think the packaging department of Puig took full advantage of this and hit a home run. On the Antonio Banderas frags… I love the guy, but the fragrances they make for him “aim” for prestige but hit “drugstore”… I am sorry Antonio!